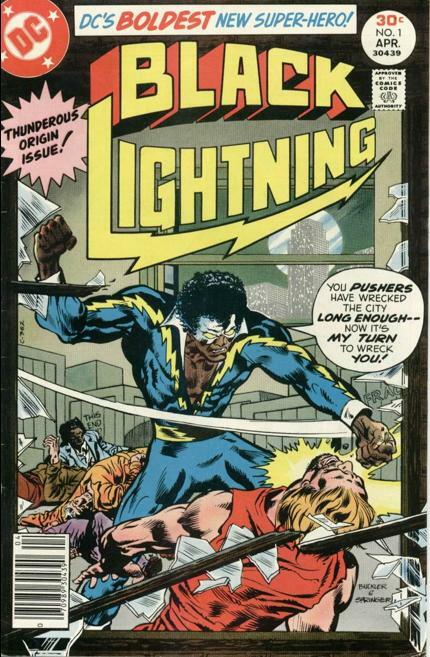 Black Lightning tears through the mob goons of Toledo a local drug dealer, once he deals with them he warns Toledo to meet him at a designated spot. Once he leaves Toledo makes plans to meet and kill him. He returns to a local tailor where they talk about his return to the ghetto and his alma Mata after being an Olympic level athlete. Once back he runs off some drug dealers and meets a student who plans to be even bigger than him. The gang members try to kill him but they fight them off. When the goons inform their boss he’s upset and tells them to send the teacher/Black lightning a message by beating up the student. When they try they cause him to get run over by a car and die. 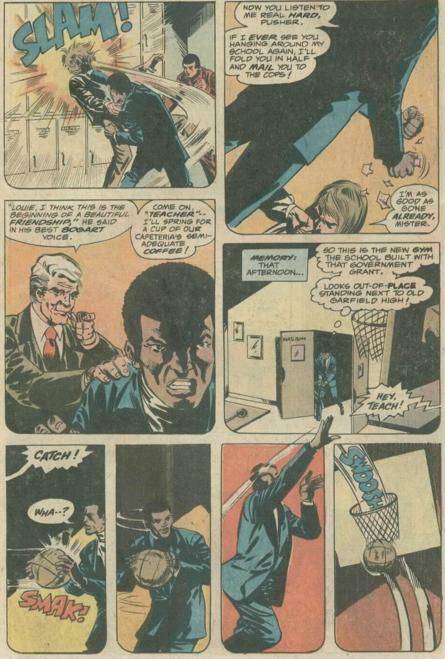 They then use his dead body as a message literally as he’s strung up on the school’s basketball court. That is when he decides he must become a symbol to drive fear into the gangs, he joins with the local tailor to become black lightning! Using his new identity he wages war on crime until he reaches Toledo. He puts back on his costume and prepares to meet the man. Toledo meanwhile has hired an assassin to deal with Black lightning permanently! Tony Isabella has a great story here, of a man who wants to help his community and ends up crossing hairs with gangs guns and drugs. Black lightning has a legitimate reason to be opposed to drugs and violence having grown in the ghetto and transcending it. As an Olympic athlete he also has a reason to be an all round better physical fighter than the average man and crook. The art by Trevor von Eeden and F. Springer also hold up quite good considering this book was printed in 1977 🙂 the story hold up good as well and is a great origin tale with reason and motivation as well as a cool costume to boot. 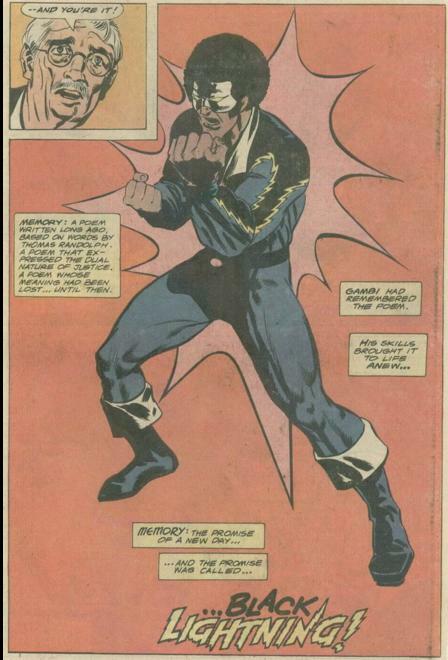 Black lightning is a great role model for young black men to have! He’s just an ordinary man in excellent condition using his mind and body to change his town one thug at a time. that Afro “cap” is also a point of contention. The sight of the dead student, Earl Clifford strung up on the baskeball hoop was quite jarring but all to real for those of us who work with youth. I almost wish Earl would’ve just been hurt real bad and end up coming back as a sidekick to Black Lightning. But I totally get why Tony made the choice he did.